Had he not secured the title of Newcomer of the Year for 2008, it would seem this year has been the breakthrough season for Japan’s Kei Nishikori. Back then he claimed his first and only ATP World Tour trophy at Delray Beach but even though he’s yet to add any silverware to that collection he’s been to two finals including the Swiss Indoors this week. 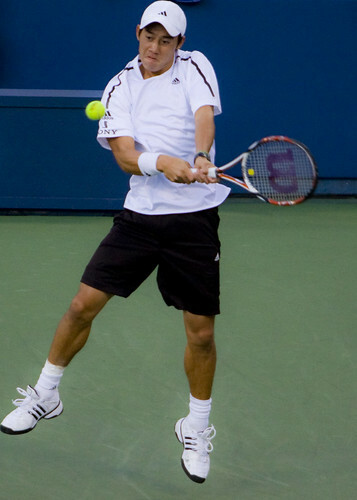 In getting there, Nishikori did the rarest of feats for a male player in 2011 by beating current world number one Novak Djokovic in the semi-finals. If getting to his first Masters 1000 semi in Shanghai last month wasn’t enough of a landmark, then the 2-6, 7-6 (7-4), 6-0 victory over the formidable Serb will certainly give him some attention. Djokovic had only lost three matches on tour all year, with two of them retirements. The reigning Australian Open, Wimbledon and US Open champion struggled with a shoulder injury in the final set so don’t read too much into the bagel. Nishikori won’t care though. He’s now one of only four people to say they beat Djokovic in his historic year and only one of two outright, the other being Roger Federer. Federer was Nishikori’s opponent in the final in Basel and although the 21-year-old lost comfortably in the Swiss’ home country he’s been given special discretion to enter the Paris Masters. Anything Nishikori does from this point is a bonus for his home nation. Having become the first Asian to win the Newcomer of the Year award, his solid 2011 season including a final in Houston to go with Basel means he’s the highest ranked Japanese player of all time. It comes after he missed most of the 2009 season through injury. He’ll now be looking to avoid another breakdown after a record season and kick on next year with a place in the top 50 secured. 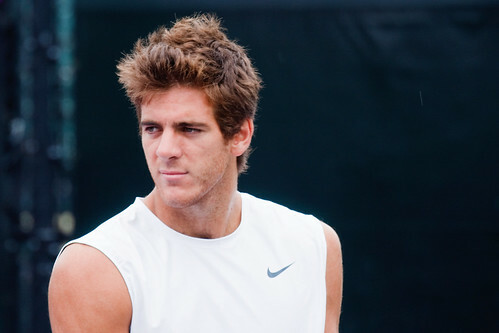 After his recent title victory at the Estoril Open, is it worth a punt on Juan Martin del Potro to win at the French? Well, yes, it’s certainly worth a couple of pounds, dollars or whatever your currency may be but just don’t bet your mortgage on the 22-year-old Argentine. Rafael Nadal is still far and away the favourite to claim a sixth crown at Roland Garros at just 24-years-old. And should he lose it’s most likely going to be to Novak Djokovic. Del Potro is a rare breed though, being one of only four men on the tour who have won a Grand Slam since Andy Roddick in 2003. That scenario was also true with Djokovic before his unbelievable 2011 form brought an Australian Open title, several other ATP wins and advertising deals aplenty. Djokovic is now considered by some to be the best player in the world right now after two tour final victories over Nadal when he’d always been living in the shadows of the Spaniard and Roger Federer. So can del Potro get there also? Another Grand Slam is definitely possible. A French Open success this year may be too much for a man still climbing the rankings after being at number 484 last February following a wrist injury. Now at #32 the 2009 French Open semi-finalist might not have the stamina to go two weeks on clay with the extended best of five set format. But players must be wary. A straight sets win over the 2009 and 2010 French Open finalist Robin Soderling last week proves the dark horse tag is suitable. We’ll learn more from del Potro this week in Madrid, especially with a third round match-up with Nadal on the cards. After disappearing from the tennis scene for a while Bojana Jovanovski returned to WTA action with a first round 6-4, 2-6, 6-3 win over Greta Arn. Kei Nishikori lost his first round match to Spain’s Pere Riba 2-6, 2-6. 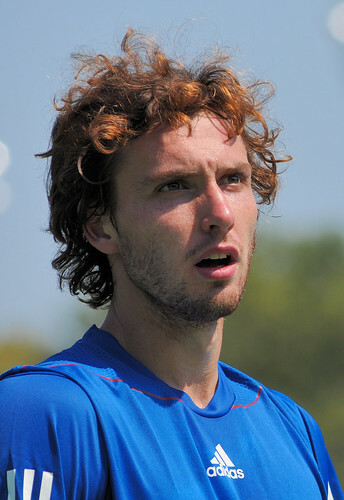 Dutch 22-year-old qualifier Thiemo de Bakker saw off world former world number one Juan Carlos Ferrero 2-6, 7-5, 6-4. Doubles specialist Vania King has aided her cause for a top 100 return in the singles rankings after a 6-1, 7-6 (7-5) win over Nadia Petrova. Wildcard Arantxa Parra Santonja is enjoying a resurgence in form. The 28-year-old beat Flavia Pennetta and Andrea Petkovic in the first and second round respectively. Following the earthquake and subsequent tsunami to hit Japan, several tennis players have tried to raise funds to support the relief effort but none will be hurting quite like Kei Nishikori. As Japan’s best player, his mind is firmly on those who have lost their lives and helping the survivors rebuild his homeland. Nishikori’s family and friends all emerged from the disaster unscathed but his thoughts are still with his people, indicated by his continued work off court. Novak Djokovic has been wearing a taped knee with messages of support for the victims and also set up a charity football match with Nishikori and other ATP tour players involved. Female Japanese players Ayumi Morita and Kimiko Date-Krumm have also felt the effects of the trauma. At Indian Wells, Nishikori wore a black ribbon during his first round defeat to Igor Andreev but he’s now reached the second round at Miami’s Sony Ericsson Open and is set to take on world no.1 Rafael Nadal on Saturday. Despite the chances of the 21-year-old beating Nadal being slim, it will be a welcome return to top-class tennis after a succession of injuries kept him out of the last three majors of 2009. At one stage he was voted the ATP Newcomer of the Year after bursting onto the scene as an unknown qualifier, winning at Delray Beach and finishing 2008 at #63 in the world. But the next year his progress was halted by injury and he slipped as low as 898 during the beginning of 2010. Now 12 months later he’s back amongst the top 100 and looking to build on where his promising career start left off. Nishikori may have been able to quickly bounce back from adversity but his fellow countrymen and women face a much greater task than hitting a ball in the service lines. To help Kei Nishikori in his Japan efforts you can bid for tennis and other sport memorabilia or donate and support the cause via Facebook.